Bagehot’s Physics and Politics was also an extension of the work of Henry Maine, which like that of John Lubbock, Lewis Henry Morgan, John Ferguson McLennan, and Edward B. Tylor, was part of the late nineteenth century effort to ground the most primeval age of man in scientific fact, using a variety of evidences from linguistics, archeology, contemporary traveler and missionary accounts, and biblical hermeneutics. Bagehot, like his Enlightenment predecessors Edward Gibbon, David Hume, and William Robertson, was most concerned to discern what factors accounted for the progress which appeared to separate refined Europe from the underdeveloped rest of the globe. Such an inquiry was given new life by what appeared to social theorists to be a satisfying account of the mechanism behind social, political, and intellectual development, that of “natural selection.” Bagehot grafted archeological, linguistic, and legal researches onto this biological causality. For Bagehot, this biological narrative was superior to the merely conjectural account of the Enlightenment due to its ability to ground a working hypothesis in natural laws, whereby the development of human civilization mirrored that of the rest of nature. Maine, like Fustel de Coulanges, described the transition of archaic civilization from savagery to urbanity as an “ascending series of groups out of which the State was first constituted” of which the “elementary group” is the family, all connected “by common subjection to the highest male descendant.” The aggregation of families forms the gens or “House,” which in turn forms the tribe, which in turn, forms the “commonwealth” (136.) All political theory, moreover, held that “kinship in blood is the sole possible ground of community in political functions” (137) and that ancient law and society placed an individual under the iron yoke of obedience to the community. This ancient polity suffered from a fatal defect. As authority was hereditary, it soon came to pass that a child or “idiot” ascended the throne. When this occurred, the “listening assembly,” those brought together initially to advice the king, “begins not only to murmur, but to speak” (274.) 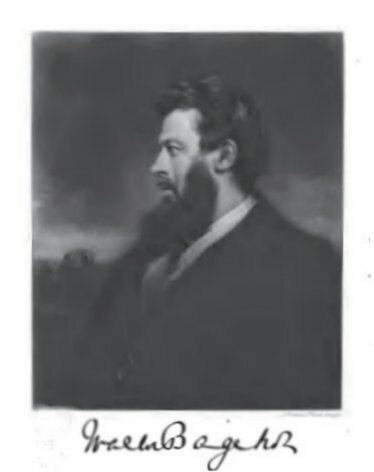 Using George Grote’s History of Greece, Bagehot contended that ancient civilization had developed into modern urbanity due to the “tentacula” of agricultural, commercial, and technological progress. The development of English civilization had followed a pattern much like that of ancient Greece and Rome. The English Civil War and the execution of King Charles was the result of the long growth of the English middle class and the “animation” of that class “under the influence of Protestantism” (282.) It was the development of these two factors which made the English polity less attached to royalty and more accustomed to criticism of government. In this way, the English became less attached to their kings and became more like the ancient Greeks. From this point forward, English government was defined by a twin tendency towards revolution and “the solid clay of the English apathetic nature” (283.) Those who wished for revolution were always a minority in England, much like the French Jacobins. Bagehot not only wished to address how society began but was as concerned with understanding how cultures advanced from a primitive to a refined state. His narrative of the causes behind the progress of civilization belonged had its roots in the Scottish and English Enlightenments. The content of this narrative very much reflected the scientific and literary commonplaces of the later nineteenth century, especially his concern with progress, degeneration, the applicability of Greek and Roman models for the growth of modern civilization, and the interconnection between natural and social laws. His understanding of physics was not that of a separate, professional discipline with its own modes of analysis and experimentation. By “physics,” Bagehot meant a law-governed nature that was perceivable to the human mind through a knowledge of history and current affairs. This genteel, literary, nearly subconscious, notion of physics and of science more generally as the orderliness of nature also visible in history and society, persisted into the mid-twentieth century in the writings of sociologists, anthropologists, philosophers, and historians. Due to the continual combat of tribe against tribe and nation against nation, there has been persistent progress in the art of warfare. The causes behind this growth and the gulf between the savage and the civilized was explicable since the “stronger nation has always been conquering the weaker” (49.) Every nation’s advancement was tied to war. Those nations who had the greatest technological advancements and the most characteristics suitable to war and conflict advanced over their neighbors. Novelty and discussion both allow for savage nations to attain civility. The transition from contract to choice was, however, for the few, having their historical origins in the ancient polities of Greece and Rome and in the localities of the Mediterranean basin. The arts, sciences, and humane sentiments essential to the progress of civilization developed above all due to freedom of discussion. “Athens, Rome, the Italian republics of the Middle Ages…have all had a special and peculiar quickening influence, which they owed to their freedom” (166.) The seminal events of history, the French Revolution, the Reformation, the Peloponnesian War, have all been the result of freedom of expression. These events together demonstrated the advances of civilized races into a more refined culture. All of these events were produced by discussions of principles and abstract reasoning. It was this lack of abstract thinking which doomed the “North American Indian,” who talked only of “undertakings” to stasis. A further note on “Physics and Politics” which Chris and I were chatting about the other day. I was reading somewhere [I’ll update if I figure out where: see below] that the term “natural philosophy” was not typically used in France, where one was more apt to find the term “physique”. However, as near as I can tell, the connotation was very similar: a “physics” was a cause-and-effect argument — but not necessarily a deterministic one — intended to create an intelligible explanation of observed phenomena. Thus, in geology, for instance, one would speak of a “physics of the earth” to create a through-time explanation of geological formations or the depositing of fossils in their current place. Such geological explanations were never mathematical. In Bagehot’s time, “physics” was becoming understood to be the rigorous mathematical analysis of certain kinds of phenomena that we now understand it to be. However, as Chris points out, older definitions clearly persisted, and references to “physics” in this, or even later, periods should not automatically be thought of as attempts to draw on the authority of a science of mathematical proof and precision measurement. It was clearly intended to mean the working out of principles underlying observed phenomena. Thus, when we think of Quetelet’s quantitative “social physics” from roughly the same period, one might understand Quetelet’s statistics as a means of identifying phenomena requiring explanation rather than uncovering a means of analyzing human populations in a way analogous to a mechanical determinism. Thus, as Chris points out, Bagehot understood himself to be partaking in a very long philosophical tradition that was once again progressing (thanks to the logic of people like Darwin); not as exploiting novel methods. Of course, as Chris shows, Bagehot’s explanatory framework trafficked in 19th-century commonplaces about progress, English civilization as the apex of polity, the natural course of Empire, and links between race and civilization. We might also note that the methods of the Cambridge mathematical tripos — intended for most who took its examination as a liberal pedagogy rather than as a gateway to becoming a physicist — was commonly understood to be a model of proper reasoning rather than as a directly applicable methodology. Instilling proper reason had been a longstanding function of the pedagogy of geometry, arithmetic, logic, and grammar. UPDATE: It’s from note 4 from Thierry Hoquet’s “History without Time: Buffon’s Natural History as a Nonmathematical Physique” in the latest Isis. Extensive discussion can also be found throughout Martin Rudwick’s Bursting the Limits of Time. A further note on “Physics and Politics” which Chris and I were chatting about the other day. I was reading somewhere [I’ll update if I figure out where] that the term “natural philosophy” was not typically used in France, where one was more apt to find the term “physique”. However, as near as I can tell, the connotation was very similar: a “physics” was a cause-and-effect argument — but not necessarily a deterministic one — intended to create an intelligible explanation of observed phenomena. Thus, in geology, for instance, one would speak of a “physics of the earth” to create a through-time explanation of geological formations or the depositing of fossils in their current place. Such geological explanations were never mathematical. Don’t forget that natural philosophy was originally synonymous with Aristotle’s physic and that appears to be how the French are using the word physique. I just found this post/site by accident – a good find! This particular long post warrants re-reading. Statements like this are indeed found in most of the histories of anthropology that I have encountered. But whilst it is true that the likes of McLennan and Morgan came to argue with Maine (and with Morgan also to echo the very title of Maine’s most famous work), it seems to me that this is a retrospective association. In his basic orientation and approach, Maine’s starting point was not the ‘primeval age of man’ but the Aryan village community. For the tools of his research he did not look to fossils nor anthropological observation of living primitive people (as suggested in the post), but to the documents of legal history. As such, Maine belongs in the tradition of comparative legal history that begins with Savigny and Niebuhr in early C19th Berlin and which is continued in Maine’s own time and country by the likes of E. A. Freeman at Oxford. It is indeed the case that at just the time that Maine began to publish the bottom, as it were, fell out of the historical time scale. That is to say, the discovery of human prehistory shifted the ground from comparative philology and related studies to a new more (natural) scientific anthropology (while, at the same time, it became accepted that the primitive village community was not a uniquely Aryan phenomena – hence allowing a universalisation of the argument, which is where Morgan, Marx and Engels came in). Nevertheless, it seems to me that much of what is distinctive about Maine is lost when he is seen as one of the first of the modern (anthropologists) rather than as one of the last of the ancient (C19th comparative scholars).